Everything needed to store and transport your motorcycle with confidence and style. Haulmark’s utility motorcycle trailers offer superior protection at the best value. (Even if your ride isn’t a Harley) An enclosed area protects your ride from road shrapnel and bad weather, while interior wheel chocks and tie-downs keep your bikes stable while in transit. 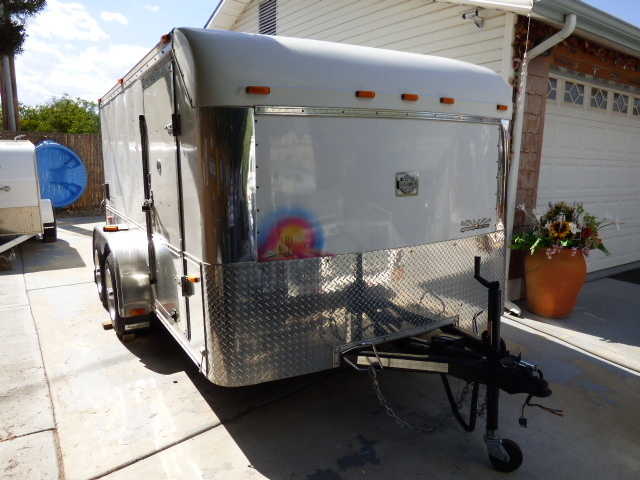 This Haulmark Harley Low Hauler is in excellent condition and has lots of options and upgrades. 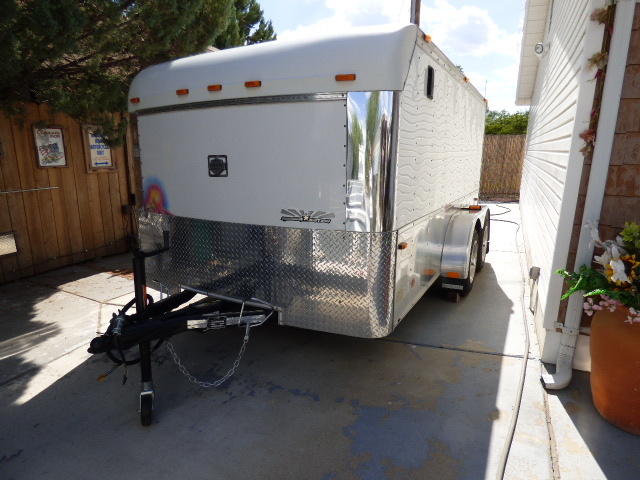 This Unit is Designed with Room to Haul 2 HD Full Dressers and Everything You Need for a Weekend Trip or a Long Haul. Heavy Duty Dual Axle, Rated 7000 GVW. Tongue Stem Jack Pedestal with Dolly Wheel. Single (Right Side) Access Door with Dual Heavy Duty Locks. 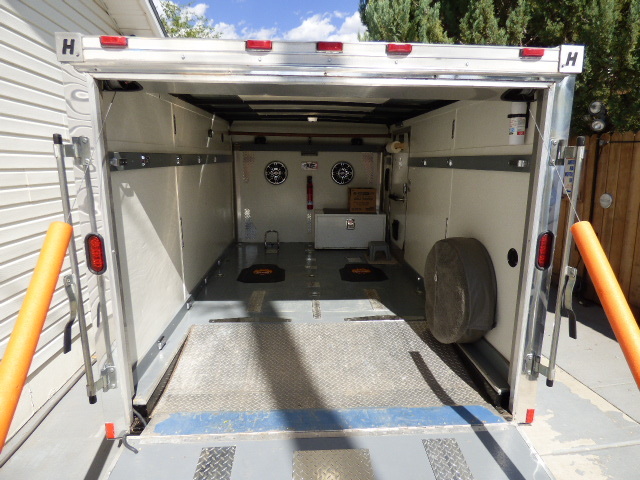 Rear Ramp Door is Dual Spring Assisted with Fold Out Ramp Assist and Heavy Duty Dual Locks. Equipped with Front and Rear Side Vents, Diamond Plate Stone Guards, 12 Volt Interior Lighting and LED Exterior Lighting. Factory Electric Front Axle Trailer Brakes. 4 New (O miles) ST205/75/15 Tires on Custom Wheels. Full Size Matching Spare Tire Included. Alpine CD/AM/FM Stereo in a Machined Billet Aluminum Custom Cabinet with Nice Speakers. Full Interior Upgrade: Painted with Diamond Plate Accents and Customized Lighting. Stained Cross Bar and Clothes Hanging Bar. Numerous Additional Tie-Downs and Anchor Points. Carpeted Steel Tool Box. 2 Pingel Removable Wheel Chocks. 2 Fire Extinguishers. Extra 12V Battery Operates the Interior Lighting for use During Disconnect. Ratchet Strap Storage Hooks. Custom AirBrush PaintWork with “Arizona Special Edition” Theme. Exterior has Many Added Reflectors and Accents. Custom AirBrushed PaintWork. This is a Very Tastefully Done, Well Trimmed Unit. Haul Your Ride or Rides with Style, Comfort, and Peace of Mind. Offers Will be Considered. Call Me with Your Ideas or Offer. Thanks for Looking.